"PURE Water At Down-To-EARTH Prices!" CT - This KDF/GAC unit sits on the counter and easily connects to most any kitchen faucet. 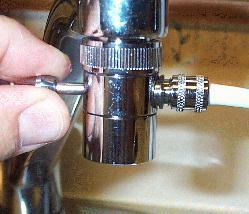 A diverter valve replaces the aerator on your faucet. In the regular position, water exits straight through its own aerator. When filtered water is desired, turn on the cold water and pull out on the diverter valve knob - water is routed through the filter and out its own swivel spout. Great for apartments, dorms, RV's or travel. Spout, diverter valve, and connectors are lead-free chromed brass - NSF-approved. Uses a replaceable cartridge (part no. CF) (included), rated to treat 12,000 gallons. Cartridge has an integrated 1 micron absolute prefilter. Flow rate is 1 gallon per minute. It can be later converted for under-counter use with part number FK, Faucet Kit ($49.00). Includes three diverter adapters, housing wrench, and chlorine test strips to verify when it's time to replace cartridge. 12" high, 5" diameter. 3 year prorated warranty on cartridge, 5 year on components. SPECIAL! 32 oz. Nalgene water bottle included FREE! Compare At - $149.00, YOUR PRICE - $89.40, with FREE SHIPPING (in U.S.)! 30 day money-back satisfaction guarantee! CTD-CB - Designed for municipal water that contains a high level of chloramines (chlorine combined with ammonia). This twin housing countertop water filter features our KDF/GAC cartridge PLUS a high performance 0.5 micron extruded carbon block cartridge in the second housing (click HERE for information). The carbon block cartridge is made from a high grade coconut shell carbon that has a high capacity for chlorine, chloramines, taste and odor removal. 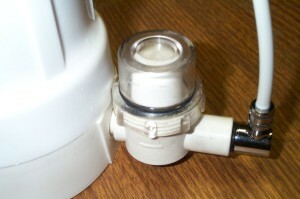 A diverter valve replaces the aerator on your faucet. In the regular position, water exits straight through the aerator. When filtered water is desired, turn on the cold water and pull out on the diverter valve knob - water is routed through the filter and out its own spout. Great for apartments, dorms, RV's or travel. Spout, diverter valve, and connectors are lead-free chromed brass - NSF-approved. It can be later converted for under-counter use with part number FK, Faucet Kit ($49.00). Includes three diverter adapters, housing wrench, and chlorine test strips to verify when it's time to replace cartridge. 12" high, 5" deep, 11" wide. 3 year prorated warranty on KDF/GAC cartridge, 5 year on components. SPECIAL! 32 oz. Nalgene water bottle included FREE! Compare At - $219.00, YOUR PRICE - $129.40, with FREE SHIPPING (in U.S.)! 30 day money-back satisfaction guarantee! Note: Other specially cartridges can be substituted - Click HERE for more information. CTD-C - This twin housing countertop water filter features our KDF/GAC cartridge PLUS your choice of one special contaminant filter cartridges! Choose the Doulton Sterasyl ceramic as a pre-filter or one of other two other Specialty Contaminant Removal Cartridges if you wish to effectively remove fluoride or sodium. 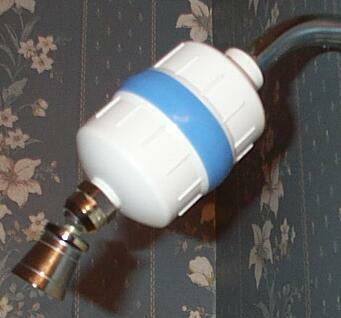 A diverter valve replaces the aerator on your faucet. In the regular position, water exits straight through the aerator. When filtered water is desired, turn on the cold water and pull out on the diverter valve knob - water is routed through the filter and out its own spout. Great for apartments, dorms, RV's or travel. Spout, diverter valve, and connectors are lead-free chromed brass - NSF-approved. It can be later converted for under-counter use with part number FK, Faucet Kit ($49.00). Includes three diverter adapters, housing wrench, and chlorine test strips to verify when it's time to replace cartridge. 12" high, 5" deep, 11" wide. 3 year prorated warranty on KDF/GAC cartridge, 5 year on components. SPECIAL! 32 oz. Nalgene water bottle included FREE! Compare At - $249.00, YOUR PRICE - $149.40, with FREE SHIPPING (in U.S.)! 30 day money-back satisfaction guarantee! CT-E - This economical counter-top unit uses our disposable KDF/GAC "in-line" cartridge, rated for 8,000 gallons, with a 5 micron sediment prefilter pad. Flow rate is 0.5 gallons per minute. Connects the same as CT unit (above). It can be later converted for under-counter use with part number FK, Faucet Kit ($49.00). Spout, diverter valve, and connectors are lead-free chromed brass - NSF-approved. Includes chlorine test tablets to verify when it's time to replace cartridge. 11" long, 2" diameter. 2 year prorated warranty on cartridge, 5 year on components. Note: This item is not certified for sale in California. SPECIAL! 16 oz. Nalgene water bottle included FREE! Compare At - $89.00, YOUR PRICE - $55.40, with FREE SHIPPING (in U.S.)! 30 day money-back satisfaction guarantee! 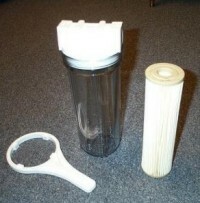 CFA-P - If you have a high level of sediment in your water, add a porous plastic sediment prefilter on in front of your countertop water filter. The disposable element removes particles down to 5 microns in size to extend the life of your KDF/GAC cartridge. Includes housing and one element. YOUR PRICE - $16.50! 30 day money-back satisfaction guarantee! Replacement element CFA-P-R YOUR PRICE - $10.00. All of our under counter filters are placed out of the way, under the sink. 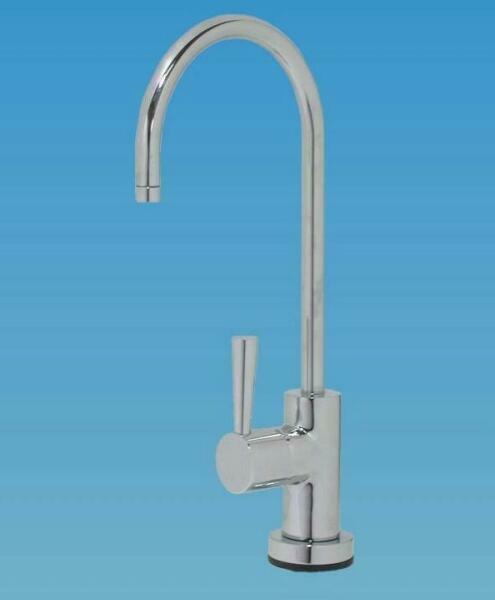 They connect to the cold water line with an "EZ faucet connector" and dispense water through an attractive long reach LEAD-FREE* solid brass faucet. Quick-connect fittings make for fast, easy installation. A 1/2" hole is all that is needed for the faucet stud (all series), but a cover plate is included to accomodate larger pre-drilled holes (such as a vegetable sprayer hole). The STANDARD SERIES faucet (pictured on the LEFT) is chrome with white plastic tip and handle. It is 8.75" tall and has a swivel spout with a reach of 5.5". A PREMIUM SERIES upscale faucet (pictured in CENTER) is also available in our for only $10 more than the standard. This elegant lead-free solid brass faucet features a smooth quarter turn handle with a ceramic seat for a lifetime of service. In addition to the chrome with brass tip and handle accent (see picture above, right), it comes in all chrome, all brushed nickel (stainless steel look), all white, all almond, all bisque, all black, all red, and all polished brass. Click HERE for picture. It is recommended that you choose the faucet to match the color scheme of your main faucet. Select color choice on order screen. It is 8.75" tall and has a swivel spout with a reach of 5.5". A new EURO SERIES designer faucet (pictured on RIGHT) is also available for only $25 more than the standard. This European-design ultra-elegant lead-free solid brass faucet features a smooth quarter turn handle with a ceramic seat for a lifetime of service. It will compliment any high-end kitchen! Click HERE for a close-up picture. In addition to the all chrome (pictured), it is also available in brushed satin nickel. Select color choice on order screen. It is 10.75" tall and has a swivel spout with a reach of 4.5". If you are looking for even higher-end faucet for your custom kitchen, check out the Waterstone Faucets web page. These are the highest quality and highest styled faucets on the market! After selecting your choice, call us with the part number and we will get you a quote (approx.$250). These faucets are drop shipped from Waterstone. Our premium series faucets may be purchased separately for $39.00 if you wish to upgrade your existing system! Includes quick-connect fitting for 1/4" or 3/8" tubing. NOTE: If you have a granite countertop or a porcelain sink and don't want to drill a hole for a separate faucet, we offer the single under counter filter configured to go directly inline on your cold water line. In this configuration, filtered water would come out of your main faucet. Filter life is reduced, however, due to uses other than drinking. Click here for more details. UC - Contains the KDF/GAC cartridge (12,000 gallon rating) in a single space-saving housing. 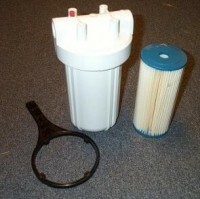 Cartridge has an integrated 1 micron absolute prefilter. Includes faucet, "EZ faucet connector" , high pressure polyethylene tubing, mounting bracket, and housing wrench. Quick-connect fittings make installation a snap! Includes chlorine test strips to verify when it's time to replace cartridge. 12" tall, 5" diameter. 3 year prorated warranty on cartridge, 5 year on components. Click HERE to download installation instructions (PDF file). SPECIAL! 32 oz. Nalgene water bottle included FREE! UC STANDARD SERIES with Standard Faucet - chrome with white plastic tip and flip handle: Compare At - $189.00, YOUR PRICE - $113.40, with FREE SHIPPING (in U.S.)! 30 day money-back satisfaction guarantee! Includes FREE 32 oz. Nalgene water bottle! UC-PS PREMIUM SERIES with Upscale Faucet (select color scheme on order page): Compare At - $222.00, YOUR PRICE - $123.40, with FREE SHIPPING (in U.S.)! 30 day money-back guarantee! UC-ES EURO SERIES with European-design Faucet (select color scheme on order page): Compare At - $231.00, YOUR PRICE - $138.40, with FREE SHIPPING (in U.S.)! 30 day money-back guarantee! UCD-CB - Designed for municipal water that contains a high level of chlorine or chloramines (chlorine combined with ammonia). This twin housing countertop water filter features our KDF/GAC cartridge PLUS a high performance 0.5 micron extruded carbon block cartridge in the second housing (click HERE for information). The carbon block cartridge is made from a high grade coconut shell carbon that has a high capacity for chlorine, chloramines, taste and odor removal. The ULTIMATE weapon against bad-tasting city water! Includes faucet, "EZ faucet connector" , high pressure polyethylene tubing, mounting bracket, and housing wrench. Quick-connect fittings make installation a snap! Includes chlorine test strips to verify when it's time to replace cartridge. 3 year prorated warranty on cartridge, 5 year on components. 12" tall, 10" wide, 5" deep. UCD-CB STANDARD FAUCET - chrome with white plastic tip and flip handle: Compare At - $269.00, YOUR PRICE - $159.40, with FREE SHIPPING (in U.S.)! 30 day money-back satisfaction guarantee! UCD-CB-PS PREMIUM SERIES with Upscale Faucet (select color scheme on order page): Compare At - $289.00, YOUR PRICE - $169.40, with FREE SHIPPING (in U.S.)! 30 day money-back guarantee! UCD-CB-ES EURO SERIES with European-design Faucet (select color scheme on order page): Compare At - $309.00, YOUR PRICE - $184.40, with FREE SHIPPING (in U.S.)! 30 day money-back guarantee! 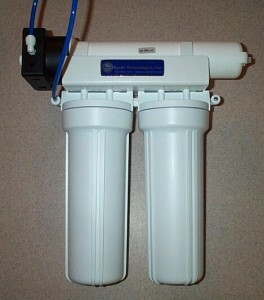 UCD - In addition to the KDF/GAC cartridge, this unit has a changeable 1 micron sediment prefilter for ultra-clean water. (1 micron is 1/25,000 of an inch, a human hair is about 100 microns in diameter). Recommended for areas with a high level of sediment or homes with old pipes. Includes faucet, "EZ faucet connector" , high pressure polyethylene tubing, mounting bracket, and housing wrench. Quick-connect fittings make installation a snap! Includes chlorine test strips to verify when it's time to replace cartridge. 3 year prorated warranty on cartridge, 5 year on components. 12" tall, 10" wide, 5" deep. Click HERE to download installation instructions (PDF file). UCD STANDARD FAUCET - chrome with white plastic tip and flip handle: Compare At - $259.00, YOUR PRICE - $155.40, with FREE SHIPPING (in U.S.)! 30 day money-back satisfaction guarantee! UCD-PS PREMIUM SERIES with Upscale Faucet (select color scheme on order page): Compare At - $292.00, YOUR PRICE - $165.40, with FREE SHIPPING (in U.S.)! 30 day money-back guarantee! UCD-ES EURO SERIES with European-design Faucet (select color scheme on order page): Compare At - $300.00, YOUR PRICE - $180.40, with FREE SHIPPING (in U.S.)! 30 day money-back guarantee! UCD-C - This twin housing under counter water filter features our KDF/GAC cartridge PLUS your choice of one special contaminant filter cartridges! Choose the Doulton Sterasyl ceramic as a pre-filter or one of other two other Specialty Contaminant Removal Cartridges if you wish to effectively remove fluoride or sodium. Includes faucet, "EZ faucet connector" , high pressure polyethylene tubing, mounting bracket, and housing wrench. Quick-connect fittings make installation a snap! Includes chlorine test strips to verify when it's time to replace cartridge. 12" tall, 10" wide, 5" deep. 3 year prorated warranty on cartridges, 5 year on components. Make your cartridge selection on the ordering screen. CUSTOM DOUBLE UCD-C STANDARD FAUCET - chrome with white plastic tip and flip handle: Compare At - $299.00, YOUR PRICE - $179.40, with FREE SHIPPING (in U.S.)! 30 day money-back satisfaction guarantee! UCD-C-PS PREMIUM SERIES with Upscale Faucet (select color scheme on order page): Compare At - $331.00, YOUR PRICE - $189.40, with FREE SHIPPING (in U.S.)! 30 day money-back guarantee! UCD-C-ES EURO SERIES with European-design Faucet (select color scheme on order page): Compare At - $340.00, YOUR PRICE - $204.40, with FREE SHIPPING (in U.S.)! 30 day money-back guarantee! 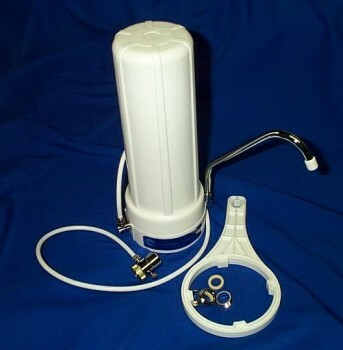 Emergency hand pump available for $49.00 - use your UCD-C as an emergency filter! Click HERE for more information. Click HERE to see our ultra violet add-on for virus protection. 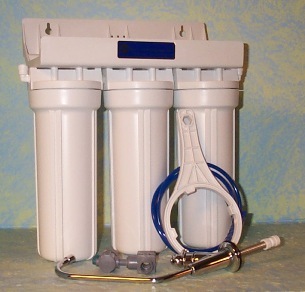 Two contaminant-specific filters can be combined with the KDF/GAC filter in this triple configuration for specific problems: bacteria, high chlorine or chloramine, fluoride, or sodium. YOU choose the two cartridges you want in addition to the KDF/GAC filter. Choose the carbon block for high levels of chlorine, chloramine and bad taste and odor. Choose the Doulton Sterasyl ceramic or one of other two other Specialty Contaminant Removal Cartridges if you wish to effectively remove fluoride or sodium. Includes faucet, "EZ faucet connector" , high pressure polyethylene tubing, mounting bracket, and housing wrench. Quick-connect fittings make installation a snap! Includes chlorine test strips to verify when it's time to replace cartridge. 12" tall, 16" wide, 5" deep. 3 year prorated warranty on KDF/GAC cartridge, 5 year on components. Make your cartridge selection on the ordering screen. CUSTOM TRIPLE UCT-C STANDARD FAUCET - chrome with white plastic tip and flip handle: Compare At - $379.00, YOUR PRICE - $229.40, with FREE SHIPPING (in U.S.)! 30 day money-back satisfaction guarantee! UCT-C-PS PREMIUM SERIES with Upscale Faucet (select color scheme on order page): Compare At - $399.00, YOUR PRICE - $239.40, with FREE SHIPPING (in U.S.)! 30 day money-back guarantee! UCT-C-ES EURO SERIES with European-design Faucet (select color scheme on order page): Compare At - $424.00, YOUR PRICE - $254.40, with FREE SHIPPING (in U.S.)! 30 day money-back guarantee! This three stage purifier provides an unparalled level of clean tasting water. The first stage is a pleated 1 micron sediment prefilter designed to keep the downstream filters clean and lengthen their life. It is replaced annually ($9.60). The second stage contains the KDF/GAC cartridge for removal of chlorine (and its tastes and odors). It is replaced about every three years ($35.40). The third stage is the Ster-O-Tap Low Pressure Membrane technology for removal sediment - down to 99.9999999% (9 log). It strains down to 0.15 microns. It does this without the flow restriction of ceramic filters, and without constant cleaning! It is replaced about every two years ($99.00). Click HERE for more information. 1 year warranty on Ster-O-Tap, 3 year prorated warranty on KDF/GAC cartridge, 5 year on components. 12" tall, 10" wide, 5" deep. The UCT-S Triple Stage Purifier includes the Premium Series Faucet at no extra charge: Compare At - $499.00, YOUR PRICE - $299.40, with FREE SHIPPING (in U.S.)! 30 day money-back satisfaction guarantee! SPECIAL! 32 oz. Nalgene water bottle included FREE! Part Number CF - Multi-media filter cartridge (KDF/GAC) for CT, UC, UCD, and NaK-UC. Will also fit housings designed for standard 9 3/4" cartridges. Clear "see-through" cartridge has an integrated 1 micron absolute prefilter. Rated to treat 12,000 gallons; 3 year prorated warranty. Includes chlorine test tablets to verify when it's time to replace cartridge. Compare At - $59.00, YOUR PRICE - $39.00! 30 day money-back satisfaction guarantee! CB - Coconut shell carbon extruded block cartridge, 0.5 micron filtration. Removes chlorine, chloramines, taste and odor, sediment and fine silt. Rated at 20,000 gallons for chlorine. 2 7/8" X 9 3/4" cartridge fits industry-standard housings. Compare at $39 - YOUR PRICE - $19.00! 30 day money-back satisfaction guarantee! CER - Doulton Sterasyl Ceramic filter cartridge for CTD-C and UCD-C. Can also be used in any industry-standard housing designed for 9 3/4" cartridges. Effectively removes greater than 99.99% of particles down to an absolute 0.9 micron. Removes 99.9% of particles down to 0.5 microns. Click HERE to see performance data. The cartridge can be cleaned up to 30 times (about once per month). 3 year prorated warranty. Compare At - $69.00, YOUR PRICE - $41.40! 30 day money-back satisfaction guarantee! 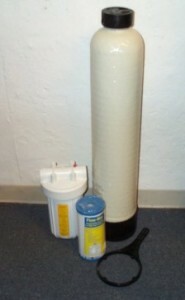 SFX-1 - This 1 micron sediment prefilter is used in the UCD model It provides ultra-clean, water. (1 micron is 1/25,000 of an inch, a human hair is about 100 microns in diameter). Deep pleat design has up to 10 times the life of other type filters, while providing less pressure loss. Will also fit housings designed for standard 9 3/4" cartridges. Note: This item is not certified for sale in California. Compare At - $16.00, YOUR PRICE - $9.60. 30 day money-back satisfaction guarantee! We offer cartridges containing special contaminant-selective media for a wide range of water problems. The most common are listed here. Call or e-mail us for solutions not listed. All are constructed from FDA grade materials. FLUORIDE REMOVAL FILTER Contains fine-mesh pre-conditioned Activated Alumina to reduce fluorides below 0.5 ppm. Its capacity is up to 11,000 ppm with effluent levels below 0.2 ppm from 10 ppm feed. Note: high pH and high bicarbonate levels reduce the capacity - above 100 ppm bicarbonate, reduce by 50%; above 200 ppm, reduce by 75%. Suggested Retail - $69.00, Your Price - $41.40. 30 day money-back satisfaction guarantee! SODIUM REMOVAL FILTER Contains a high-efficiency ion-exchange resin regenerated in the potassium form. It will remove virtually all sodium (and hardness) and exchange it for potassium. Can be regenerated using potassium chloride brine (about once a month). Suggested Retail - $69.00, Your Price - $41.40. 30 day money-back satisfaction guarantee! The Ster-O-Tap Low Pressure Membrane technology removes particles - down to 99.9999999% (9 log). It strains down to 0.15 microns. It does this without the flow restriction of ceramic filters, and without constant cleaning! It is replaced about every two years. Click HERE for more information. It can be added to any existing filter or reverse osmosis system as a final treatment (it is recommended that a prefilter of 1 micron or less be used). 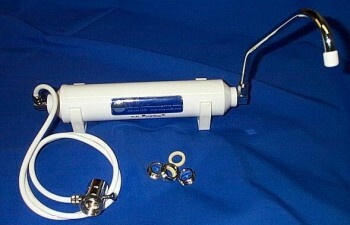 The Ster-O-Tap module kit includes the housing with Quick-Connect fittings for 1/4" tubing, and the Ster-O-Tap cartridge. YOUR PRICE - $149.00. 30 day money-back satisfaction guarantee! Ster-O-Tap replacement cartridge: YOUR PRICE - $99.00. IL - KDF/GAC filtration for refrigerators with ice-makers and/or water through the door, water fountains, water coolers, commercial coffee makers and ice machines. High-pressure quick-connect fittings can be used on either 1/4" o.d. copper or plastic tubing. Recommended flow rate: 0.5 gpm. Rated to treat 8,000 gallons; 2 year prorated warranty. Includes chlorine test strips to verify when it's time to replace cartridge. 11" long, 2" diameter. 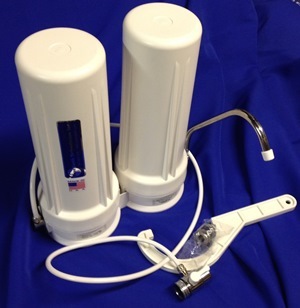 Click HERE for more detailed information on our KDF Economy Shower Filter (pictured on left). 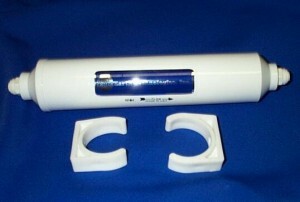 Click HERE for information on our new KDF Back-Washing Shower Filter with replaceable cartridge. 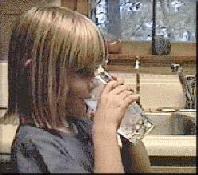 Click HERE for more detailed information on our whole house water filters for municipal water. 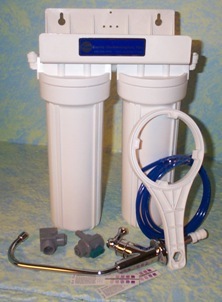 SPF-34 - This sediment prefilter housing and cartridge is designed for 3/4" main water lines. The replaceable pleated cartridge removes sediment, silt, sand, dirt down to 1 micron (lasts about 3 months). Housing accepts any industry-standard 9 3/4" long by 2 1/2" diameter cartridges. Inlet and outlet are 3/4" female pipe threads. Suggested Retail - $49.00, YOUR PRICE - $29.00! Extra Replacement Cartridges - $9.60 Each. 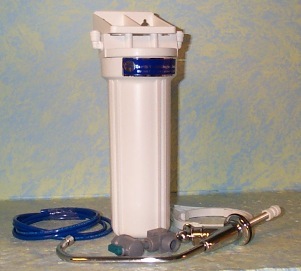 SPF-1 - This sediment prefilter housing and cartridge is designed for 1" main water lines. The replaceable pleated cartridge removes sediment, silt, sand, down to 1 micron (lasts about 6 months). Housing accepts any industry-standard 9 3/4" long by 4 1/2" diameter cartridges. Inlet and outlet are 1" female pipe threads. Suggested Retail - $99.00, YOUR PRICE - $69.00, with FREE SHIPPING! Extra Replacement Cartridges - $23.00 each.